Having a coop full of chickens can be great. Some people breed chickens as a hobby, while others have chickens for the fresh eggs and fresh meat. Whatever your reasons are for having a coop, you need to keep them warm and safe over the cold, winter months. Chickens are very strong birds as long as they have food, water, and a solid structure for shelter, they can survive the winter. 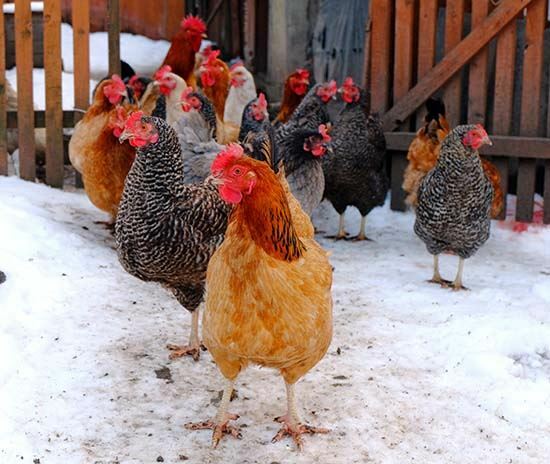 If you want to keep your chickens happy, healthy, and laying eggs, you would want to know how to winterize your coop to prepare it for the cold months ahead. This will provide your chickens with a draft free and clean environment. Make sure to clean out the coop before winter, removing and also cleaning any dishes, nest boxes, perches and anything else. Use scrubbers and scrapers and industrial strength cleaner to remove all the droppings from the inside of the coop. If any accessories are broken or cracked, now is a good time to replace them…anything that you cleaned should be left in the sun to dry. After you removed and cleaned everything from the inside of the coop, take a good look to be sure that it’s ready for winter. Check the airflow and if there is too much of a draft, more than likely your birds will be cold. If you don’t have enough of an airflow or if there is any chance of water entering the coop, the humidity can rise and create a breeding ground for parasites and disease in the coop, which is extremely dangerous for your birds. You want to make sure that there is about a 40-60% humidity level in your coop all year round. The cold air and snow aren’t the only thing to be concerned about over the winter…there are cold, hungry predators waiting around hoping to find their next tasty meal. Entry points to the coop are important in protecting your birds. Make sure the doors, hatches and any other openings are properly hinged and that they can close tightly. Inspect the coop for signs of leaking water. The coop’s roof needs to be water tight. Replace any sections of roof that are questionable immediately. Check the coop for any cracks, holes, or any area that could let cold air in. If necessary, seal up some of the hatches or vents for the winter. Check around your coop for signs of predators. Look for tracks, feces, or partially eaten foliage. If you notice anything, reinforce any weak areas so that they can’t get inside. Inspect any electricity that you may have that runs to the coop. Make sure that the outlets, wires, and hardware are in good shape and that the cords aren’t frayed. Inspect the bedding in the coop. Make sure there are no mice or other rodents leaving feces in the bedding. If the bedding is not clean enough to be top dressed, you should replace all of the bedding. Some people will replace the bedding in their coop every fall, while others don’t find it necessary. Some bird owners leave the bedding in for the winter because the decomposing bedding and the manure can create heat inside the coop. If you MUST change the bedding, don’t worry, it won’t take much time for enough manure to build up after you replace the bedding, and it will also keep the coop warm. There are a few types of bedding that are great to use for the coop all year long. Straw – Straw bedding is very easy to get your hands on. You can use strictly straw or you can mix with other types of bedding. Wood Shavings – Shavings made of pine and aspen are very popular. As long as the shavings are chicken friendly and provide insulation, they can control the odor in the coop and keep the bugs away. Shredded Paper – Shredded paper is NOT the best choice for bedding because it decomposes & compresses so quickly. It does however, make a great lining for nest boxes to provide additional insulation. Because we live where the temperatures drop into the single digits at times, you should provide a heat source to keep the chickens warm. The best way to provide additional heat is to use radiant heaters or heat lamps. If you made sure that your coop is completely insulated, you shouldn’t need more than a 100-watt bulb. Make sure that the heaters are in the corner so that the chickens can get away from the heat if they need to. If we would happen to get a few warm days, like we’ve had in past winters, it could be too much heat for the chickens. It’s important that your chickens are always well fed, especially during the winter. It takes a lot of energy to stay warm during the winter. Your chickens need about 10% more calories during the winter than in other months. During the winter months, chickens can get stressed which can make it hard for them to lay eggs. To help keep them feeling better, you should give them corn or pecking foods such as forage cakes. If your birds need some bulking up, you can give them oatmeal. If you really want to give your chickens a treat and keep them happy, feed them lettuce, alfalfa, or wheat grass. This will keep them happy when they can’t forage on their own. Your chickens need a constant source of fresh water all year. During the winter, when temperatures drop to freezing, the water in the coop can freeze over, and do you want to go out first thing in the morning to break the ice? Consider purchasing a water heater, and believe it or not, the birds actually like the warm water during the winter and you can rest assure that there will always be fresh drinkable water in the dish. Just be sure that the wires are out of the chickens’ reach and that they are not damaged. Final Year End Sale on Shrubs! Free with any Live Christmas Tree Purchase! !